Home users and small businesses can benefit from the impressive speed and versatility of an advanced cable modem like the Arris TM822G Touchstone. It is suitable for even the most demanding environments thanks to its high capacity to deliver fast data rates. In addition, the TM822G features troubleshooting solutions that allow you to identify network problems in a more efficient manner. It is also a great alternative for Comcast customers who don’t want to pay extra every month for renting a model from the cable provider. We’ll find out more about this cable modem in this review. Arris is a well-established manufacturer and the TM822G is one of its fastest and highest rated modems. The technical specifications include: 2 lines telephony interface RJ14, 10/100/1000mbps Ethernet Interface, 48 V DC Supervisory Voltage and up to 8 bonded channels, as well as 64 or 256 QAM Modulation. When it comes to VoIP, the modem stands out thanks to its two redundant primary lines and the possibility to use a battery pack. This allow you to be on the phone, even if there is no power available. 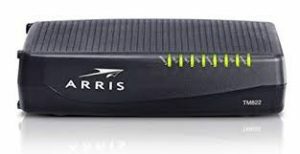 The Arris TM822G keeps things simple by using only 5 connections on the back including an RJ-45 Ethernet port to connect to your router and a coax “F” option to connect to the cable provider. The TM822G can deliver over 300Mbps into your home of business using cable. It also supports multiple protocols: Legacy SIP (Session Initiation protocol), NCS (Network Based Call Signaling) and PacketCable 2.0 IMS signaling protocols. This variety of options gives flexibility to VoIP users as they can choose the option that suits their preferred methods. You can also test your Internet connection using the ISP side or internal wiring side with the advanced diagnostic tools that are available to find out if there is an internal wiring issue, or is the issue is related to connectivity to your Internet Service Provider. The highlight of the TM822G is speed and you can enjoy impressive performance. It supports up to 8 bonded channels for downstream connections and 4 bonded channels for upstream connections. Furthermore, the TM822G deserves recognition for supporting PacketCable 1.0 and 1.5, IPv6, encoded speech codecs G.711, G.726, G.728 and G.729E. It also has T.38 fax relay support. These set of options mean that the device can support a wide range of tasks and it is likely to remain relevant for quite a while. The Arris TM822G also offers a variety of configuration options that allow you to adjust Loop Voltage Management, Loop Current or Ringing Waveform. The Arris TM822G is a great choice, particularly for users with advanced VoIP needs. It also works well for Comcast subscribers who don’t want to rent the modem from the company. The TM822G offers fast performance and it is designed to suit a variety of requirements. Thanks to its specs, it is not likely to become outdated very soon.